Which Managed VPS Gives You More For Your Money? If you’re thinking about buying a VPS for your business but haven’t found the right one, or you’re looking for one with fully managed services, you’ve found yourself in the right place! At Crucial, we pride ourselves in our hosting range, and we wanted to show you just how much love we put into it. 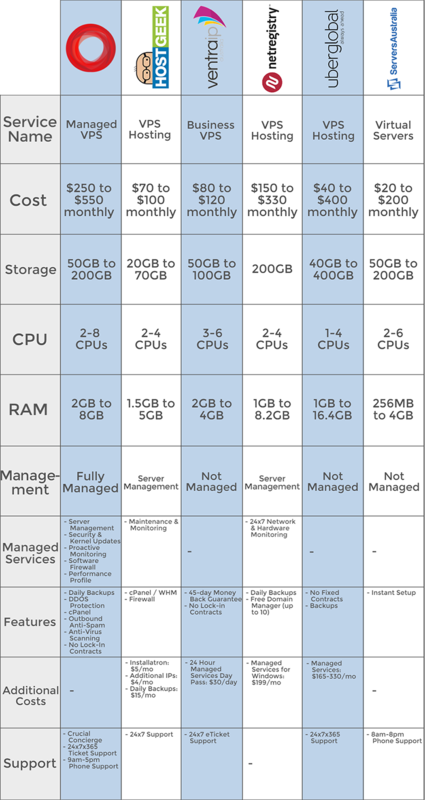 We’ve done some research and have found the highest ranking Australian VPS solutions for SMBs and upwards, and using this information, we’ve constructed the handy table below to show how our Managed VPS service weighs against other Australian managed VPS hosting services. Visit our website for more information about our Managed VPS service — www.crucial.com.au/vps/managed-vps/. Brought to you by Crucial. Looking for great VPS Hosting? Rock-solid VPS Hosting with superb support from Australia's VPS experts, Crucial.